Forty years ago today, physicists working with the Gargamelle bubble chamber at CERN presented the first direct evidence of the weak neutral current. The result led to the discovery of the W and Z bosons, which carry the weak force – and ultimately to that of aHiggs boson announced last year. 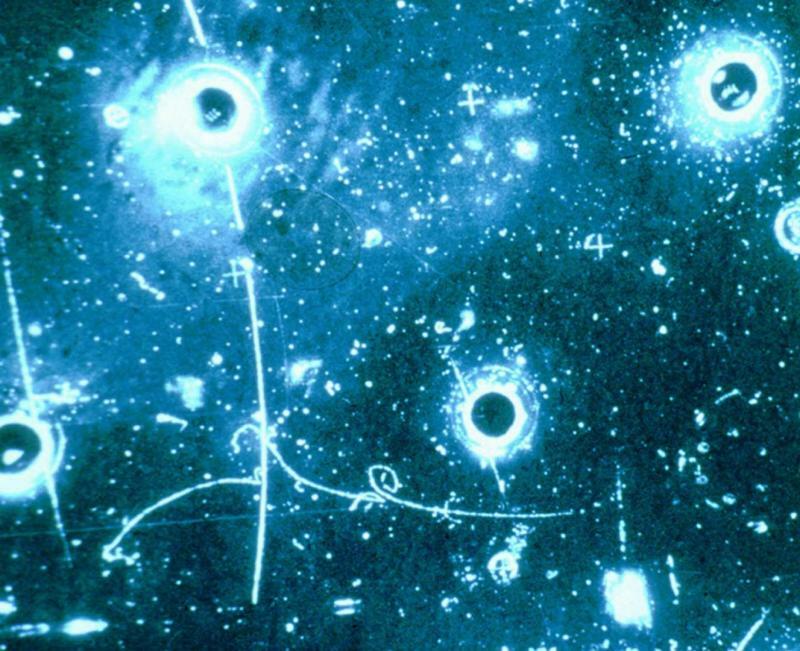 Gargamelle was a bubble chamber at CERN designed to detect neutrinos. It was 4.8 metres long and 2 metres in diameter, weighed 1000 tonnes and held nearly 12 cubic metres of heavy-liquid freon (CF3Br). In a seminar at CERN on 19 July 1973, Paul Musset of the Gargamelle collaboration presented the first direct evidence of the weak neutral current – a process predicted in the mid-1960s independently by Sheldon Glashow, Abdus Salam and Steven Weinberg – that required the existence of a neutral particle to carry the weak fundamental force. This particle, called the Z boson, and the associated weak neutral currents, were predicted by electroweak theory, according to which the weak force and the electromagnetic force are different versions of the same force. The discovery involved the search for two types of events: one involved the interaction of a neutrino with an electron in the liquid, while in the other the neutrino scattered from a hadron (proton or neutron). In the latter case, the signature of a neutral current event was an isolated vertex from which only hadrons were produced. By July 1973 the team had confirmed as many as 166 hadronic events, and one electron event. In both cases, the neutrino enters invisibly, interacts and then moves on, again invisibly. Paul Musset presented the results of both hadronic and leptonic analyses at the seminar at CERN. The paper on the electron event had already been received by Physics Letters on 2 July (F J Hasert et al. 1973a); the paper on the hadronic events followed on 23 July (F J Hasert et al. 1973b). They were published together in the same issue of the journal on 3 September. The discovery of weak neutral currents was a significant step toward the unification of electromagnetism and the weak force into the electroweak force. In 1983, the UA1 and UA2 experiments at CERN confirmed the existence of the W and Z particles predicted by the theory of neutral currents. This entry was posted in High Energy Physics and tagged CERN. Bookmark the permalink.